The Vietnamese Embassies in Japan on August 31 organised ceremonies to mark the country’s 73rd National Day (September 2). Ambassador to Japan Nguyen Quoc Cuong at the ceremonies to mark the country’s 73rd National Day. At the event, Ambassador to Japan Nguyen Quoc Cuong recalled Vietnam’s socio-economic achievements since it won independence 73 years ago. 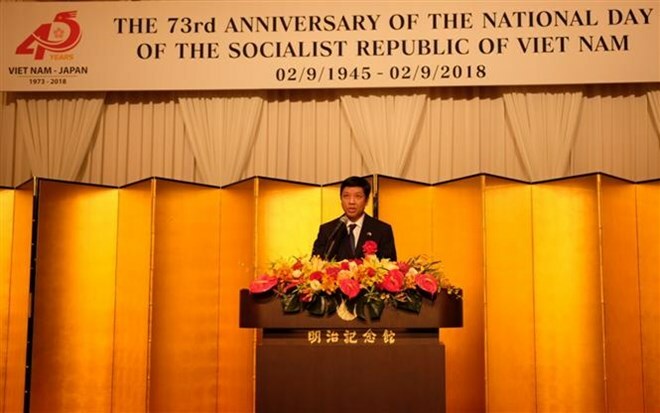 He thanked the Japanese Government and people for giving support to Vietnam, especially in economics, and wished that the development of the Vietnamese community in Japan, with 300,000 people, will make contributions to socio-economic growth in both countries. Japanese Minister of Justice Yoko Kamikawa hailed Vietnam’s recent development, hoping that friendship between Vietnam and Japan will be enhanced for peace and prosperity in the two countries as well as in the region.